This Floor Puzzle is Used but remains in Excellent condition, with minimal signs of wear and plenty of life left in it. The puzzle in this box is 24 pieces. 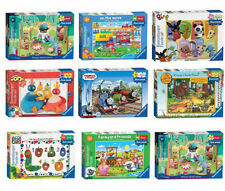 FOUR jigsaw puzzles for our younger jigsaw puzzlers. 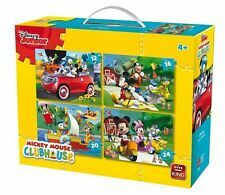 4 IN 1 DISNEY JIGSAW PUZZLE BOX SET. Reasons to buy from Quickdraw. Suitable for ages 3 Years. 28cm x 20cm when finished. Ravensburger Paw Patrol - 4 in 1 Jigsaw Puzzle. Condition is Used. Dispatched with Royal Mail 2nd Class. New listingRavensburger 24pc Paw Patrol Skye and Everest Giant Floor Jigsaw Puzzle - ... .
Ravensburger 24 Pieces Paw Patrol Skye and Everest Giant Floor Jigsaw Puzzle.Size 69 cm x49 cm Condition is good. Dispatched with Royal Mail 2nd Class. 5 out of 5 stars - Ravensburger 24pc Paw Patrol Skye and Everest Giant Floor Jigsaw Puzzle - ... .
2 product ratings2 product ratings - Ravensburger 24pc Paw Patrol Skye and Everest Giant Floor Jigsaw Puzzle - ... . Included are 24 interlocking pieces that create a Giant Electronic Floor Puzzle. Once the puzzle has been completed the children can use the electronic pen to answer fun quizzes on shapes and colours. Developed and designed especially for children aged 2 years , this fun-to-learn jigsaw puzzle is made from super-thick, double laminated card. With 16 large, sturdy pieces (just right for the age group), the bright, vibrant and fun illustration shows The Gruffalo, Mouse, Fox, Snake and Owl in the deep dark wood. ELC "Enchanted Castle" 24 piece Jigsaw In a Tin, for Age 3 - 6. Condition is Used. Dispatched with Royal Mail 2nd Class. Room On The Broom 24 Piece Floor Jigsaw Puzzle. 2 x WALT DISNEY'S 101 DALMATIANS JIGSAW PUZZLES. IDEAL FOR YOUNG CHILDREN WHO LOVE JIGSAW PUZZLES. 07360 RAVENSBURGER DISNEY FROZEN 4 IN BOX [CHILDREN'S JIGSAW PUZZLE] NEW IN BOX! MPN: 07360. So join popular characters Elsa, Anna, Olaf and Sven on this set of high quality jigsaw puzzles. Product Group: Children's Jigsaw Puzzle. Product Type: DISNEY FROZEN. • Puzzles cut to 12, 16, 20 or 24 pieces in strong card. 5 out of 5 stars - 07360 RAVENSBURGER DISNEY FROZEN 4 IN BOX [CHILDREN'S JIGSAW PUZZLE] NEW IN BOX! 2 product ratings2 product ratings - 07360 RAVENSBURGER DISNEY FROZEN 4 IN BOX [CHILDREN'S JIGSAW PUZZLE] NEW IN BOX! Paul Lamond Floor Puzzles - Room on the Broom, The Highway Rat - FREE P&P! This fantastic My Little Pony 24 piece giant floor puzzle features a colourful rainbow scene in Equestria. 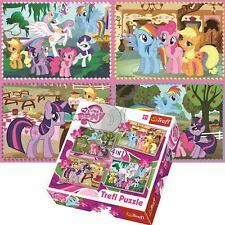 Puzzle together Fluttershy Princess Celestia Rainbow Dash Twilight Sparkle and Spike Princess Luna and Princess Cadance. Featuring all your favourite Trolls. Included are 24 interlocking pieces that create a Giant Electronic Floor Puzzle. Once the puzzle has been completed the children can use the electronic pen to answer fun quizzes on shapes and colours. Up for grabs is this 35 piece Jungle Junction jigsaw puzzle made by Jumbo. It has a finished size of approx 31 x 22 cm (12.2" x 8.6"). Jigsaw Puzzles. Film / TV Related. This item isNEW & SEALED. Don't forget to. MPN: 07339. Developed and designed especially for children aged 2 years , this fun-to-learn jigsaw puzzle is made from super-thick, double laminated card. With 16 large, sturdy pieces (just right for the age group), the bright, vibrant and fun illustration shows The Gruffalo, Mouse, Fox, Snake and Owl in the deep dark wood. Ravensburger Disney Sophia the first 4 in 1 Jigsaw Puzzle 12, 16, 20 & 24 pieces. As new. Dispatched with Royal Mail 2nd Class. Manufactured by Ravensburger. Four shaped puzzles in one featuring the Disney Princesses; Rapunzel, Aurora, Belle and Cinderella. House of Puzzles. JR Puzzles. Four puzzles in one. Lovely girls jigsaw book exellent condition padded covers. A giant 24 piece floor puzzle featuring A story of a good natured witch and her contented, purring cat flying through the air on a broomstick picking up a dog, bird and a frog along the way, making the broom very overcrowded. Triple puzzle fun! Its beautiful graphics and the ability to create together with other players are the reasons why children love playing puzzles. The box contains three puzzles: consisting of 20, 36 and 50 pieces. When the puzzle is finished, baby can play with the Paw Patrol electronic pen, to solve lots of fun quizzes on shapes, colours numbers and logical association. Electronic interactive puzzle: 24 maxi-puzzle tiles that create a gigantic 67.5 x 98 cm floor mat. Puzzle together Fluttershy, Princess Celestia, Rainbow Dash, Twilight Sparkle and Spike, Princess Luna and Princess Cadance. 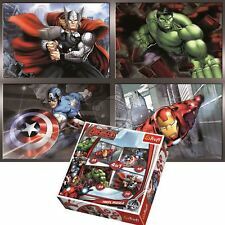 High quality 24 piece cardboard jigsaw puzzle. Made from strong premium grade cardboard, with linen finish print to minimise glare on puzzle image. Ravensburger Puzzle - Despicable Me. Ravensburger Puzzle - Despicable Me.. Condition is New. Dispatched with Royal Mail 2nd Class. 5 out of 5 stars - Ravensburger Puzzle - Despicable Me. 38 product ratings38 product ratings - Ravensburger Puzzle - Despicable Me. The Princesses shown are Cinderella, Aurora, Belle and Rapunzel. Each puzzle has been carefully designed to ensure plenty of colour, detail and visual clues, to help young princesses develop their jigsaw building skills. Disney princess 24 maxi piece Puzzle used. Condition is Used. Dispatched with Royal Mail 2nd Class. I have other children's puzzles listed i always combine postage to the best of my ability upto 2kg weight for £2.95 2nd class postage. Clementoni Paw Patrol Syke Giant Interactive Mat Floor Puzzle Jigsaw Kids. Condition is New. Dispatched with Royal Mail 2nd Class. Ravensburger My First Floor Puzzle - Gruffalo Jjgsaw floor puzzle. Developed and designed especially for children, this fun-to-learn jigsaw puzzle is made from super-thick, double laminated card. With 16 large, sturdy pieces (just right for the age group), the bright, vibrant and fun illustration shows The Gruffalo, Mouse, Fox, Snake and Owl in the deep dark wood. This is a beautiful puzzle featuring a picture of 4in1 - Ponies' Holiday My Little Pony. From idyllic cottages and iconic landmarks to stunning wildlife and fanciful vignettes, Trefl puzzles have quickly become the choice of puzzle enthusiasts around the world. Trefl puzzles feature high quality blue-board construction, precisely cut interlocking pieces and vivid, richly-saturated colors to ensure an outstanding finished product. Clementoni Paw Patrol Girls Electronic Giant Floor Jigsaw Puzzle. 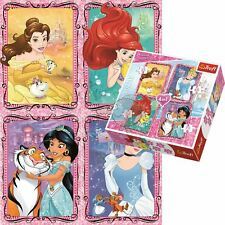 CHILDRENS DISNEY PRINCESS 4 SHAPED 10, 12, 14, 16 PIECE JIGSAW PUZZLES. MPN: 07398. This set of four Disney Princess puzzles, each showing the Princesses wearing a beautiful colourful dress. The Princesses shown are Cinderella, Aurora, Belle and Rapunzel. Each puzzle has been carefully designed to ensure plenty of colour, detail and visual clues, to help young princesses develop their jigsaw building skills. This is a beautiful puzzle featuring a picture of 4in1 - Frozen Disney. From idyllic cottages and iconic landmarks to stunning wildlife and fanciful vignettes, Trefl puzzles have quickly become the choice of puzzle enthusiasts around the world. Trefl puzzles feature high quality blue-board construction, precisely cut interlocking pieces and vivid, richly-saturated colors to ensure an outstanding finished product. 24 PIECE WINNIE THE POOH JIGSAW PUZZLE. 24 Child Friendly Pieces. Reasons to buy from Quickdraw. Girls Puzzles. Unisex Kids Puzzles. Mickey Mouse. Minnie Mouse. 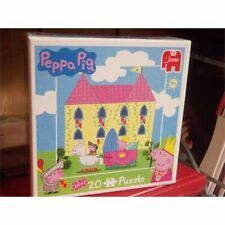 Peppa Pig Puzzles. Any unauthorised use or disclosure may be unlawful. The Puzzle Outlet operates from several large warehouses in Greater Manchester. Disney Frozen Foam Jigsaw Puzzle. Age 3+. Very Good Condition. Jigsaw Puzzle Djeco Sleeping Beauty 24 Pieces 24" X 8 "